I love traveling. It is one of life’s simple treasures that I thoroughly enjoy and something I am bent on doing for the rest of my life. It seems that in every different places I’ve been to, I bring with me beautiful memories akin to a prized heirloom. Traveling also helps to me recoup my sanity in the midst of all these palpable chaos and makes me well grounded on things that I’m truly grateful for. I have never traveled to unfamiliar places alone. I scoured enough reason for me to understand why this is so or if I should really care at all. It slightly bothered me that I’ve never took a stab at traveling without friends in tow. I mean why not? What is wrong with traveling by yourself? It is all too easy to get used to the familiar comfort of family and friends’ company. I can just text any one of them and some may go with me in a heartbeat. But solo traveling is a different story. It’s an unfamiliar terrain that I have not explored fully and one that I can’t elaborate without a little trepidation. I am one of those folks who can’t throw away their inhibitions simply because being on the safe side of the fence is far better than treading on the unknown. What if the bus I’m riding on suddenly breaks down leaving me stranded in the middle of nowhere? Am I prepared if I encounter a gangster on the street? Or won’t it look awkward to eat alone in a resto? That and host of other worries are what’s stopping me from even trying. I realized my perception of how the world operates is as as skewed as how the media and the rest of the world wants to show it. Reading up on real experiences from solo travelers’ blogs, these bad scenarios don’t happen 90% of the time, they say. And if they do happen, they’re an isolated case—a matter of wrong place, wrong time. Of course, the dangers of being raped, getting injured in a vehicular accident, feeling sick eating a foreign food are REAL. Bad things can happen to anyone at any time at any place–even in your own backyard. That’s why every seasoned solo traveler will advise you to take every precaution there is in the book and do your homework before setting foot on a different place. Yes, fear can also be good. Fear is what keeps us aware of the present and has mobilized humanity to survival for many years. But I have been engulfed by fear too much to even appreciate how traveling can change me personally. I will find that courage to do solo traveling. I won’t let any travel plans get hampered should any of my travel companions bail out on me. When traveling with others, each one has to be patient enough to compromise and wait for each one to agree on an itinerary. Sometimes, travel plans are ultimately canceled before it has even started. However, solo traveling can afford me the freedom to accomplish my travel goals in my own terms. I am the captain of my own ship. I’m not going to wait for that perfect timing. There will never be enough perfect timing in this lifetime. In the Philippines alone, we are beset with more than 20 typhoons each year. Any day in the calendar can be a day of calamity or a momentous event. Or both. I’m just sorely disappointed with myself that I didn’t travel to some exquisite places in the Visayas when I had the chance. Typhoon Yolanda beat me to it. I’ll stop making excuses and just GO! I am so done with making excuses and procrastinating. I want to come around my fears and take a leap of faith. I want to trust, to love and connect with the world the best way I can; to be genuinely free and and not be defined by people’s well-meaning but unfounded skepticism; to travel alone and become a better version of myself. So there. I’ll stop blabbering for now and draft my own itinerary. We’ll see how this will work out for me. I’ve traveled alone in Europe and also in South East Asia and if you are not prepared bad things will happen believe me! You’ll get a terrible fever, panic attacks and there are bad people lurking in dark shadows believe me. But the antidote is good planning, make sure you are well researched, plan to stay and reserve well reviewed and safe hotels and resorts, and watch your back you know who you can trust and who you shouldn’t, that’s a gut feel. Also remember the reason for traveling solo is probably to go a little wild – or a lot wild – so that does carry some risk just mitigate as best you can. Seriously, and I’m not joking, I think a good way of mitigating risk is to carry a pair of brass knuckles. I’m 6’3″ and weigh 280 pounds and can handle lots of situations but I still carry mine, makes me feel good. As a woman if you slipped on a pair of those you would stand a fighting chance in lots if situations, those things hurt and even kill. Ok anyway good luck! Well, good job Jaz! 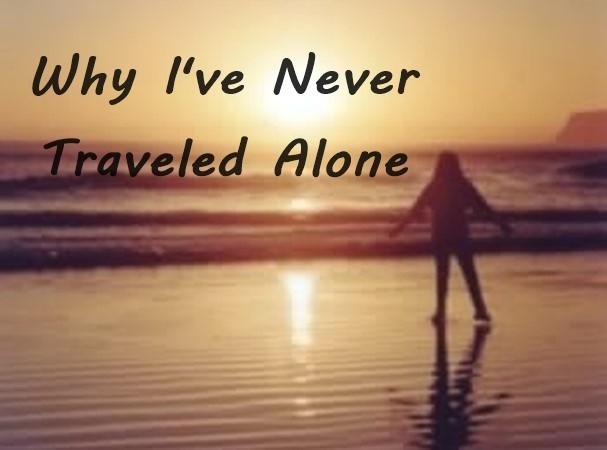 I’ve been traveling solo ever since college. It’s sometimes scary but it makes you free and all points you mentioned are valid. Looking forward to your first solo trip ever! I’m scouring over the internet too so that I can travel solo once again. I thought of that as well. What am I scared of? What’s really stopping? All these irrational fear is just inside my head with immediate danger at all. I feel like this post is written for me as well. Haha. I haven’t tried traveling alone yet. (And to think I’ a travel blogger) It is one of the things that I really wanted to experience. My partner always accompanies me with ALL my trips. I am a sickly and clumsy traveler that’s why I tend to think a lot of ‘What Ifs”. But yeah you’re right, we should stop making excuses and just go. Hehehe. Yes, we should or else we wouldn’t know what we’re missing. I used to feel scared about solo travels before too but let’s just say that something changed that. Plus, I earned loads of new friends along the way. It was quite an experience and all I needed was courage and a little push. Have faith and welcome life’s surprises. Really? What place did you travel solo? That is really cool. Go, girl! The only thing stopping you is yourself. Have faith and take that leap. We will be awaiting the stories you will tell us one experience at a time. Good luck and happy travels! Thank you. I surely will do it. Come to think of it I haven’t traveled alone, too! I think travel – like many experiences – is best shared with someone. But exploring new places ALONE also has its rewards; I’m sure it will be very empowering and memorable in the end. Good luck to your future travel adventures – solo or otherwise! Do you also want to travel solo or with someone else? How can a mom let her two kids miss whatever it is that she can discover during her travels? No, I cannot travel alone too 😀 Traveling is best if shared with people you really care about. Oh well, in your case, it’s different. That is why while I’m still single, I need to explore places on my own before I go that phase. Yes, I will. Thank you. For those interested to travel alone, it’s must to do a great deal of research. Times are scary but life would be so boring if we just live in our comfort zones. Thank you, Emjae. I wish the best on your travel journey as well. Your travel blog rocks as well. I know right! I feel that I’m really missing out a lot if I just rest travel plans with other people. I’m even thinking of doing it here in Cebu muna before going abroad.. Same here for the same reasons. I wanna try it one of these days but I’m such a scardy cat! Hahahah! So I’m not really alone here. Welcome to the club, Jhanis. True. For business travels you will really have no choice but to do solo traveling. Thanks, Chanel for your words of wisdom. Yes, naglakaw-lakaw naman ko to some places here in the city alone but nothing really major. So I might venture out and go full blast about solo traveling soon. The first time I left home was to college – yes my mother and sister dropped me off – but I did it basically alone. I went from Chicago to Arizona and knew of a few people who were attend the same university, but that was it. I took a backpacking and hiking class in order to explore the mountains and meet cool people. That was the beginning of my solo traveling. I ended up spending almost three months in Europe alone. I met some of the most amazing people along the way – who I am still friends with after 18 years later. I continued to travel solo to Peru as I volunteered for a month and travelled on the weekends. I took a spur of the moment trip to Costa Rica for two weeks. I rented a car and drove from the east to the north and then west. And most recently I did another last minute trip to London. As you read some were in large cities others in small remote villages. Some people I travelled with for a day to three weeks. Whether eating in a restaurant, exploring the countryside, checking out museums, sporting adventures, or sitting in a park I never felt lonely while I was alone. Just try it even if you begin by eating solo at a local spot or go to the movies. Then try a weekend away. Thanks for sharing your story, Molly. That motivated me even more to travel alone. I can’t help but feel a little envious that you’ve gone to so many exotic places and you’ll never have to live a life of regret. I should also try that for myself. I did some small solo-travels to nearby places but not as far as venturing outside to a different country, though. At least, not yet but soon I will try to explore Vietnam, Laos and Cambodia by next year. Good for you, Camille. Since the last time I wrote this post, I have travelled to nearby provinces on my own but didn’t get the chance to write about my experience. But I’m hoping to have another solo travel in Iloilo soon (and I’ll make sure to blog about it) so good luck to me!